Are pesky squirrels feasting on your bird’s dinner plate? If so, there are remedies to deter this uninvited guest. The little known fact about squirrels is how highly intelligent they are. They assume any food is their food. If it looks delicious, they will figure out a way to get their chubby little hands on it to eat. Squirrels are fun to sit back and watch, at least until they dominate your bird feeder. Not only will your favorite birds stay away, there is a good chance the squirrel might even destroy that cute bird feeder. You can opt to purchase a squirrel proof bird feeder. There is a huge variety available. Some of the newest designs even close down a bird feeder when a squirrel lands a jump. 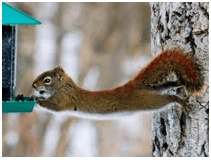 Many people have resorted to building their own squirrel proof bird feeders. One of the easiest and least expensive ways to handle your squirrel problem is to build some kind of baffle. A baffle is simply a cylinder or dome shaped device which can sit over your bird feeder. The definition of baffling has now extended to other areas of deterrence (such as plastic bottles attached to a wire) in a host of creative ways to ‘baffle’ the hungry furry mammal. They vary in design as some will have rotating cylinders to shake the surface, throwing the squirrel off. Other designs can include a sloped disk or tapered cones. They can be made of metal or plastic to create a slippery surface. If your birdfeeder has a roof, the roof can be altered to act as a baffle. You will have to work with it, and adjust the positioning to really keep those critters out. The most important key factors to remember when creating a baffle are to use non-toxic, clean materials. The next is to create the baffle to rotate or shake when a squirrel jumps on. This will promptly drop the squirrel on the ground. You can build a homemade baffle system using the help of a horizontal wire to suspend the feeder and set it up with baffles that block squirrels from scampering from the wire to the feeder. Attach each end of the wire to any close and convenient structure like a post or tree. Puncture a hole in the bottom of each bottle. This is actually a popular way to deter squirrels. It is a homemade baffle recipe using plastic one liter bottles. Simply make holes in the bottom of the plastic bottles, large enough to get around the post of your bird feeder. Hang them lengthwise and secure a few inches below the feeder with…of course, duct tape. Hanging feeders can use the same method by sliding the bottles down the wire to place them above the bird feeder. Another a viable solution is to take plastic soda bottles and drill holes in the bottom and string them on a heavy galvanized steel wire, about 30 feet in length. Hang the bottle contraption above your feeders, adjusting the proximity and length in accordance to how many bird feeders and height. By hanging the bottle line above, squirrels will automatically roll off the slippery bottles. To some people squirrels are entertaining and an absolute joy to sit and watch. For others, they are a nuisance interfering with other backyard preferences. Squirrels are so common; it is very rare you will not find one foraging around your yard or chattering from a tree. The challenge to hold them at bay remains a big enough one that bird feeder designers are still working hard to deliver a perfect answer. Squirrels are up to the challenge every bird feeder presents. 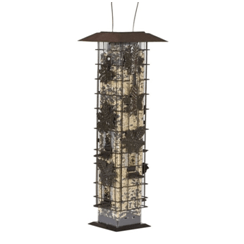 The best solution exists most likely in purchasing an inexpensive new type of cage bird feeder, and then creating your own baffle system. If you do not hold a huge aversion to squirrels, then simply build them a platform feeder far away from your bird feeders. By doing this, you will have solved your problem. Squirrels are territorial animals, and will run off any new squirrels in an effort to protect their food supply. You will also be surprised at the birds you will attract at the base of the squirrel feeder due to sloppy eating by these crazy little critters.